Our cooking area is equipped with a kitchen. Its instruments and appliances have been carefully chosen for gastronomic elaboration and practice. The dinning room has space for up to 12 people. Our cookery space differs from other places because it is in the countryside, 30 minutes from Barcelona in the incomparable setting of the Montserrat natural park, and because you have the chance to spend more time or even stay in a cottage / farmhouse with our accomodation options. Lovers of gastronomy will find a comfortable and excellent space for cooking, designed to work in groups of up to 4 cooks. If you need help in preparing the pantry and buy the best local food we will help you. 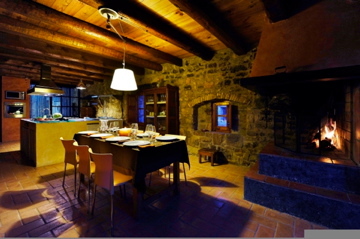 Your guests, friends, family or colleagues will enjoy your meal and the atmosphere only to be found at Cal Sant Miquel cottage. Companies wishing to hold a meeting can arrange catering and chefs that we can provide. We also have multimedia equipment; and inside the house there is wifi net. Our wine and beer tasting from our cellar would complete such a nice event. The fact we are in a nature trail only 30 minutes from Barcelona and our rural accommodation offer make us different. At Holiday home Barcelona we give you the opportunity to share the experience and feel the sensations you get by cooking. We have all the necessary and best equipment for all the recipes you wish.